Optimizing New Car Ordering Through Local Market Insights – Monitor Competitors. Benchmark Performance. I love to chat with dealers about new car ordering. Recently I’ve discovered that some dealers spend hours per week “secret shopping” their competitors’ websites to take inventory of what their competitors are stocking, to see if they can reveal certain vehicle configurations/price points that resonate more strongly with local consumer demand and thus turn quicker. Yet, most dealers find this to be difficult. Demanding time commitment – The challenge is always that they’re only as good as their ability to continue to manually monitor competitor websites and record this information in Excel. Difficult to fully analyze results – Dealers have a hard time tying online inventory to actual sales and turn time in their local market (to see which units are actually selling the fastest). There are few who would argue with the fact that the automotive industry is facing headwinds that are only going to get worse over the remainder of the year (increased inventories, increased incentives, softening consumer demand, more used inventory to steal demand from new cars). As a result, it’s time dealers up their game in terms of how they order and stock new cars, to be prepared for a tougher near-term where they won’t be able to sell their way out of the excess supply of undesirable units. Recent advances in technology offer opportunities for dealers to easily gain valuable competitive insights to help their business. When I was at Autotrader, we recognized that stocking the right car (that met local consumer demand) and pricing it correctly resulted in an amplification of the effectiveness of a dealer’s advertising dollars. 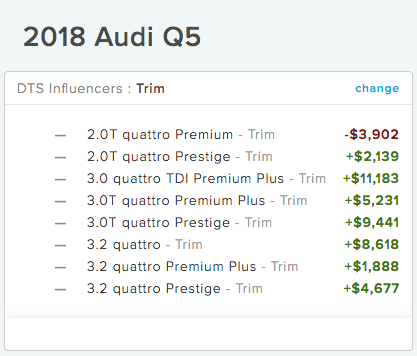 Alex Vetter at Cars.com has recently echoed this, citing his “four P’s” (Product, Price, Place, Person), recognizing the importance of “right car, right price” to a dealer’s success within the Cars.com advertising ecosystem. Other than keeping meticulous records of what your store has sold in the past, coupled with keeping daily tabs on your competitors’ websites and then feeding that information to a data analyst who can translate all of this information into actionable reports, how should a dealer think about stocking new cars that meet local consumer demand, turn faster and maximize front-end profit? Many dealers are finding that all of the data they need is readily accessible. If dealers know where to look, there is great real-time information available about which vehicles are being stocked locally, which configurations are selling quickest, and how competitors are pricing and repricing as supply/demand changes locally. Industry headwinds are forming, and it’s time for dealers to “dial-in” their new car operations to ensure they aren’t taking unnecessary inventory risk as the market slows over the coming months. Learn from the competitors in your local market and how you can take an advantage from them. CompetitorPro differentiates around the features that matter most to our dealers. Real-time data – no more waiting for aged DMV registration data to understand your local market share and who’s gaining ground — and then be frustrated at not being able to uncover why. Deeper competitive intelligence – we provide our users the ability to deep-dive into specific competitors’ operations and learn from them. Comprehensive data insights – we provide greater granularity of Trim, Color and Options than any other solution on the market, and translate these vehicle features into their implication on days to sell and price to market of specific units within your local market. Customizable views for your interests – we allow our dealers to customize their competitive set down to only those specific competitors they care about. 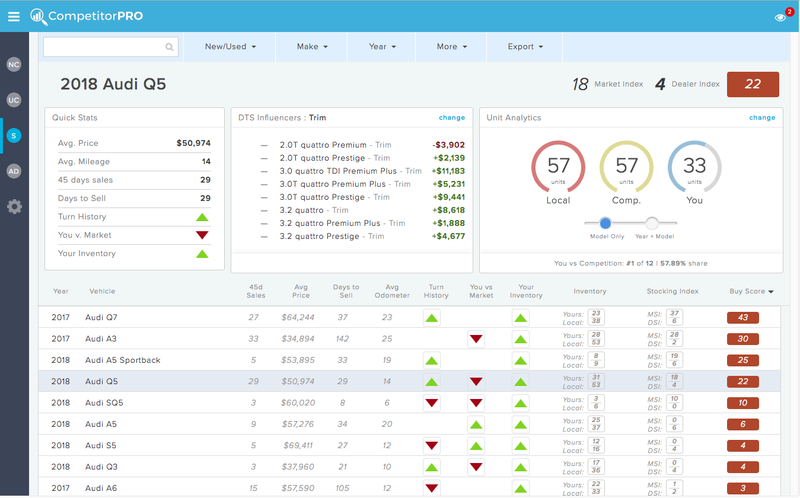 CompetitorPro is the industry’s first competitive intelligence tool built specifically for automotive dealerships. It’s getting harder out there, and today’s automotive dealer must have the solution that incorporates the latest and best strategy, tools, and tactics for success. CompetitorPro is that solution. © 2019 Monitor Competitors. Benchmark Performance.